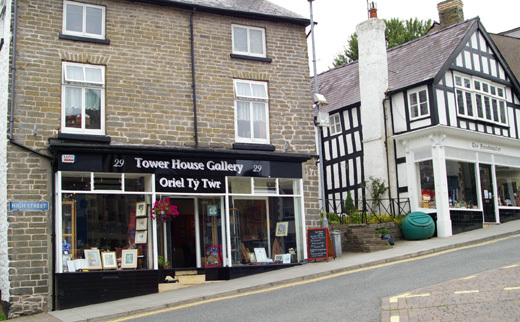 The Tower House Gallery is small but perfectly formed! Mae’r Oriel Ty Twr yn fach ond yn perffaith! We offer – gallery space; drawing materials; Fairtrade bags, scarves, books and other goodies; textiles from India, Pakistan and the Middle East; vintage kimonos and hoari jackets from Japan; some very unusual cards (including in Welsh from Driftwood Designs); books by Logaston Press and Welsh publishers Seren, gifts designed and made in Wales plus scrummy tea, coffee and home-made food – all within the downstairs space of a late Georgian Town House in the centre of our super market town. We dare you to enter and not buy! Rydym yn ofyn iddych chi dod mewn ac dim brynu! See what’s on the menu in the The Café, who’s exhibiting in The Gallery and make contact via the form on the Contact page. 29 High Street, Knighton, Powys, LD7 1AT. All text and images on this site are copyright © The Tower House Gallery and individual contributors, 2015. No re-use of any material is allowed without the express written permission of the site owners. Please see the Terms and Conditions page for information on using this website.